Google has just started to roll out a new Microsoft Office plugin called Cloud Connect to Google Apps for Business customers that will allow your Microsoft Office files to automatically sync with Google Docs. Every time you hit save in Word, Excel, or PowerPoint the changes will automagically be synced with a corresponding copy in Google Docs. 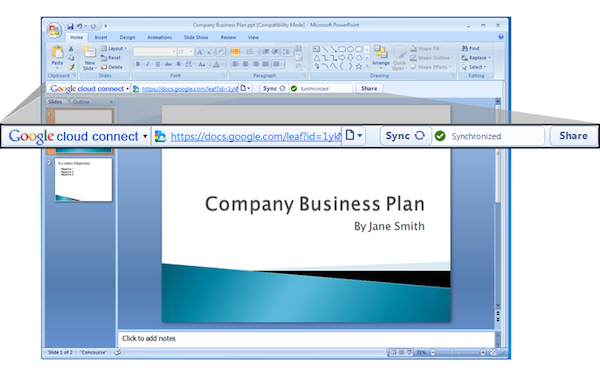 After installing the Cloud Connect plugin, a Google Docs link will appear in the ribbon of Office applications (image above). 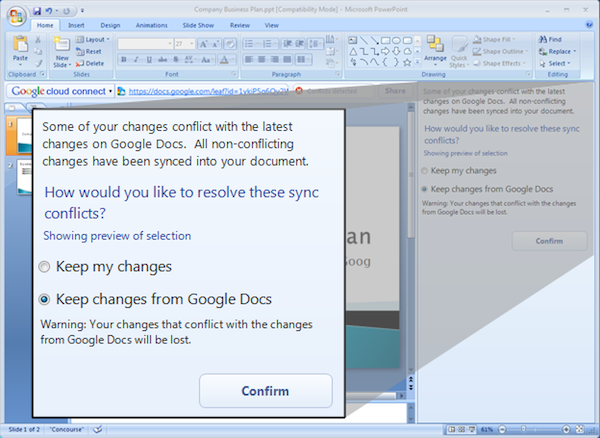 Currently if you edit the synced document in the Google Docs editor, the changes will not be saved to the original Office file. However, a new file can be generated if you wish to view the changes you made in a native Office application. Unfortunately there is not support for Mac OS X users as of yet due to the “lack of support for open APIs on Microsoft Office for Mac”. Cloud Connect plugin supports Microsoft Office 2003, 2007, and 2010. Google Apps for Business customers can sign up for the preview program here. We will let you know when an official public release is made available.